We are happy to provide assistance helping you to find the best quality laminated timber. We provide laminated timber corresponding to varying sizes and strength criteria, guaranteed to have long life spans and meet your needs. A century ago it was possible to acquire sawn timber with dimensions of 150 mm * 450 mm, with lengths up to 20 meters as the raw materials derived by natural means facilitates such dimensions. Nowadays, however, it requires some effort to have access to materials with dimensions of 75 mm * 250 mm * 5 m. In addition to this, sawn timber is becoming increasingly expensive. Due to the aforementioned reasons it is nowadays rare to find ceiling beams which have been constructed from a single log or beam. Construction logs of varying quality are becoming increasingly more expensive and hard to come by. As a result of this the use of artificial timber products is becoming ever more widespread. In most cases such products are meant for special purposes as the quality requirements are often somewhat unorthodox with regard to the strength, durability, dimensions, etc. Glue Laminated Timber (Glulam) has been designed in order to be used in load bearing structures. Glulam is derived by gluing together at least four sizeable timber lamellas in a manner that the grain of the lamellas runs longitudinally along the laminated timber components. In most cases the sawn timber used must be strength assorted, with top layers consisting of lamellas having the best properties. By correct choice of lamellas, it is possible to manipulate the qualities of the laminated timber along desired lines. Weatherproof glues are utilised in the manufacturing process, which allow the use of laminated timber in outdoor conditions. The lamellas can also consist of finger jointed parts which facilitate production of laminated timbers of virtually unlimited dimensions, with transport loads being virtually the sole constraints placed upon maximum dimensions. Using the finger jointed method to manufacture lamellas makes it possible to extract all segments that could potentially diminish the strength or quality of the lamellas. It is also possible to manufacture arch or semi-circle shaped lamellas by bending it during the gluing process, thereby giving the finished product the desired shape. Use of bent laminated timber facilitates construction of architecturally outstanding structures. Laminated timber beams have been certified by the MPA Stuttgart Otto-Graf Institute. The primary strength classes are GL 24, GL 28 and GL 32 (for more detailed information on strength classes see below). What are supply times for laminated timber beams? Where are laminated timber beams usually used? 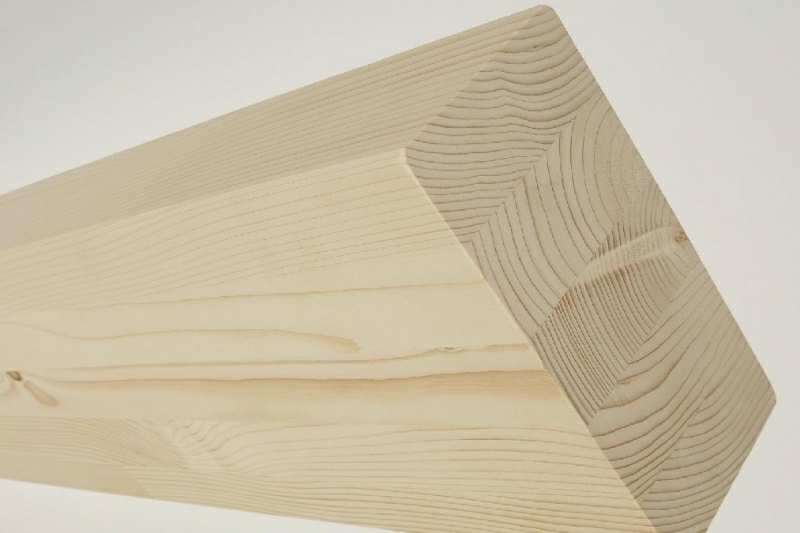 Which timber is used for the manufacture of laminated timber beams? What are the advantages of using laminated timber beams? What type of glue is used in the manufacture of laminated timber beams? Laminated timber beams are marked by the acronym GL (glulam). Associated strengths of laminated timber beams are given in the table below. The values for strength and rigidity of laminated timber beams are measured by the units N/mm2 and density kg / per m3. The following table includes the names of strength classes pursuant to DIN 1052-1/A1: 1996-1910 in cases where compliant with DIN 1052: 2008-10.